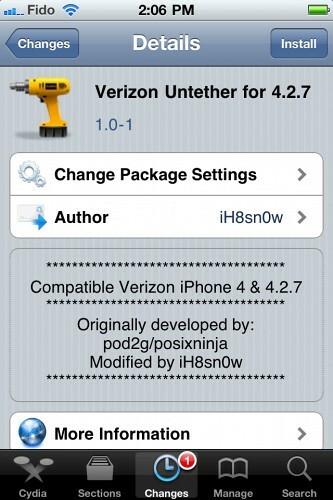 iH8Sn0w and Pushfix have released a Cydia package to untether your currently tethered Verizon 4.2.7 iPhone. This package will work for those who have jailbroken by pointing RedSn0w to the 4.2.6 ipsw. I originally ordered a Verizon iPhone 4 for my upcoming SHSH blobs dumper. Then I + many others on twitter realized that an untether was not available for 4.2.7. Over the past few weeks, I've been sick and didn't do much, but today I was finally able to get the strength to work on this Verizon untether. Since i0n1c's payload is not easily reversible, I went to previous exploits. After trying, pod2g's + posixninja's kernel exploit for 4.2.x is STILL in 4.2.7! After some more work, I managed to get this thing untethered! You can install the "Verizon Untether for 4.2.7" by adding the http://cydia.pushfix.info repo to Cydia. iH8Sn0w has also released Sn0wBreeze 2.6.1 with support for the iOS 4.2.7 untether. OSX Lion new external monitor settings.